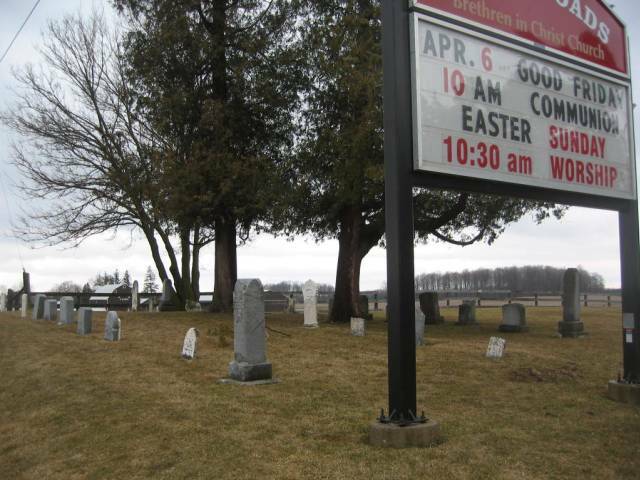 This cemetery was originally known as the Union Cemetery, Puslinch. A Union Church would have been used by several different church denominations, or perhaps ministers from different denominations would alternate in preaching at a Union Church. Often, the Tunkers (now known as Brethren in Christ) would share a church building with the Mennonites. The following comes from A BRIEF HISTORY OF THE MENNONITES IN ONTARIO, by L. J. Burkholder. In the spring of 1890 there came to Conference (the Mennonite Conference) a request to hold meetings at Puslinch in Wellington County every four weeks. The meetings were held at the Union Church House. The Brethren in Christ and others, alternated with Mennonite preachers in holding services. At the end of 1898 these meetings were again discontinued. Son of Veronica (Bechtel) and Nathan Clemens, husband of Elizabeth Gingerich.